Bhubaneswar, Aug 12 : A skeleton of blue whale is the latest addition to the Regional Museum of Natural History in Bhubaneswar, Orissa. The skeleton is of the Baleen Whale, probably the largest of its kind to be housed in an Indian museum. It measures 47.3 feet in length. The whale was reportedly washed ashore on Gopalpur beach on June 29, after which, scientists are working to preserve its skeleton. They took eight days to de-flesh the whale, the skin, blubber muscles and the viscera in particular. G Indresh, curator and scientist in-charge of the museum, said visitors can the biodiversity of marine life along the eastern coast by examining the skeleton. "Nobody has seen a whale. 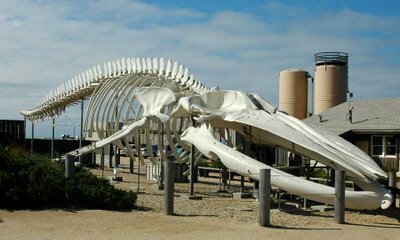 You cannot imagine the size of the whale, but if you present a skeleton structure like this, visitors can imagine how big the animal is and we can associate it with other marine life along the coast," said Indresh. "We will make a story line along keeping this skeleton, we can show all other dolphins and other marine species and we can develop it as an eastern coast marine biodiversity and can develop it as an important educational exhibition," he added. Shwetashri Purohit, a visitor, said the display of a blue whale''s skeleton is a very good initiative on the part of the museum, since this could be an important source for information and education on marine life. "Museum took the initiative and collected it by decomposing flesh from the bones and also treated chemically and has made the skeleton of a whale and this is a very good initiative and educative too for our knowledge and is an important resource for our information," said Shwetashri.